Things to note: the hydrangea is in bloom, the Sycamore has dropped many of its leaves (??) and the four FIG TREES are enormous, full, green, and lush. I was so curious to find out more about the cycle of the fig trees…what they do, when it happens, etc. The landlord warned us that they would eventually drop their leaves and instructed us to pile all the leaves around the base of each tree. These trees are all mature and very well established trees, plus we have a “micro climate” here in Brooklyn – the protection these trees have from the house, the garage, and the tree-lined fences to the east and south eliminate the need to wrap the trees at all. Perhaps that was necessary when they were young, but these trees have been here for a long, long time and were brought over from Sicily by the landlord’s relatives! The oldest and biggest tree is nearly 50 years old! 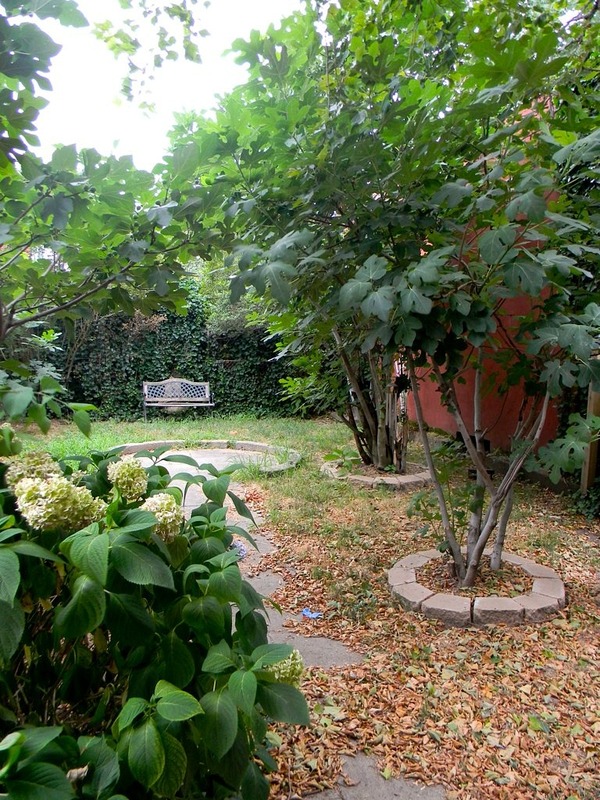 They looked strange without their big, exotic leaves last fall but my husband and I were not prepared at all for the drastic change that took place when the landlord came, with his CHAINSAW, and pruned them. And I do not mean cut them back, I mean chopped the trees pretty much in HALF. I nearly cried when I saw him doing it. Actually, the landlord’s chainsaw broke after he did the three smaller trees…and he never came back to prune the big tree. Yes, it was a pretty bleak winter with all the leaves and grass gone and the fig trees chopped down so severely. It was hard to believe they would grow back anywhere close to as full as they had been. We wondered if we’d get any figs this year…friends who knew how big they were last year were shocked to see them hacked away and debated how long it would take them to come back. I examined all of the cuts very closely and all of the small, twig-like branches that remained wondering where on earth any new growth would come from. One benefit of having the trees cut back so far was that our yard had a lot of sunshine this spring – much more than I would have imagined, and it was great for my bulbs and other spring-blooming flowers. Much to our surprise and delight, the trees have indeed begun to grow back…fiercely! They were beginning to leaf out around Memorial Day and since then they have really taken off. I’m hoping my sunny perennial border won’t be too upset about this gradual increase of shade, but I’m thrilled we’ll have figs this year! This is “fig tree #2” – looking good! This is the largest fig tree. Actually, these pictures were taken on June 15th, and the trees have already filled out even more. Last week there were tiny little figs-to-be, about the size of the eraser on top of a pencil. Over the weekend they were at least the size of my fingertip – about double in size compared to last week. It’s time to get a canner and start looking ahead at fig preserve recipes! 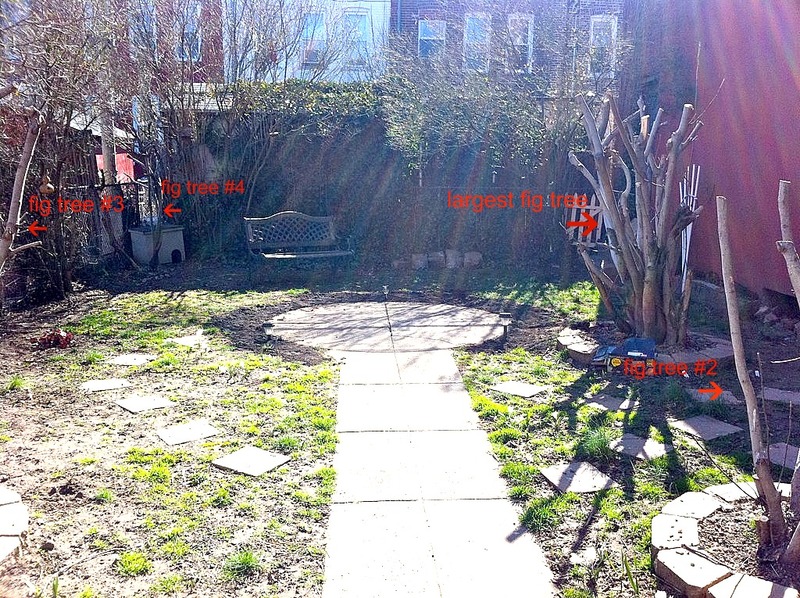 This entry was posted in Gardening and tagged brown turkey figs, fig tree, white figs. Bookmark the permalink. ← Our first week of CSA – the booty! How fun to have fig trees. I have rarely eaten fresh figs, but any fruit you can grow yourself is an incredible (organic) bonus. Thanks, Carolyn. I would likely never have grown them myself, but since our landlord’s family from Sicily planted them years ago we get to enjoy them! I’ve heard that baking halved figs at 350 with a little brown sugar sprinkled on top for 10 min or so is really good. There’s also figgy pudding which is a cake that I plan to make for the first time this year, and who can deny making fig newtons from scratch? As for tending to the fig trees, it’s perfectly normal to prune fig trees to half their size, sometimes more, but you really don’t want to go more than half each year. It takes a lot to kill a fig. Also, you don’t want ants to climb on your trees. This video is great to teach how to do just that http://www.youtube.com/watch?v=1dLyJJxbEV8. Alex Silber goes into how to tape your tree, how often to apply Tangle Foot or Vaseline, how often to replace the tape, and a little bit more. You also don’t want to have suckers growing on your tree either. Suckers are new stems from the same root system and take a lot of energy away from the parent plant. Any energy lost by suckers could have gone to create bigger or more figs. Figs generally are ready for harvest by August. By the time late September hits, I will remove every leaf possible to trick the fig tree into ripening the figs that are growing. Any figs that are on the tree by first frost will be hard and more than likely no good to eat. The removing of leaves should be done a good month before first frost. We have a single fig tree and it’s older than I am which means it’s at least 28 years old. 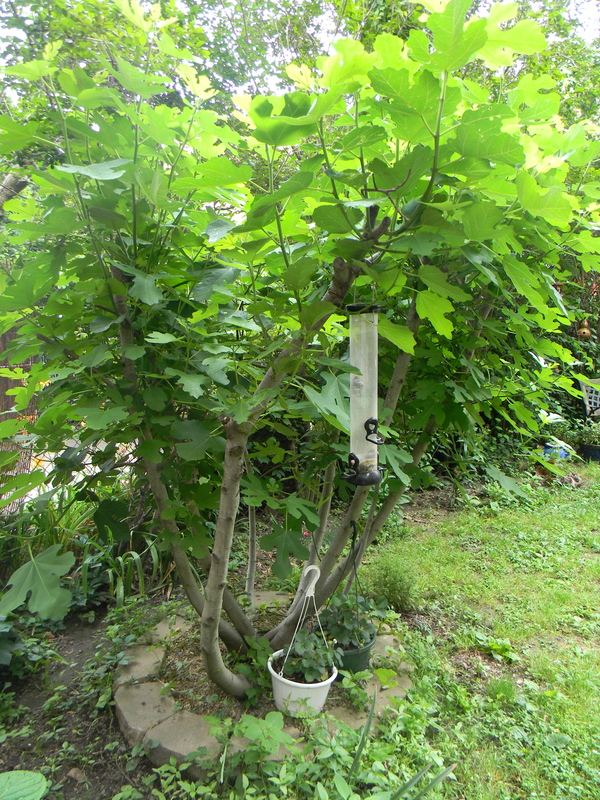 I’ve often thought of cutting a branch off to grow a 2nd tree, but our single tree makes a good number of figs as is. For anyone that isn’t sure what parts are edible, the whole thing except the top where the fig was attached to the tree is edible. Wow look how much they have grown back! I would have freaked out too at the chainsaw. But I guess he knows what he’s doing. You are indeed fortunate to have that microclimate for the fig trees. Here in zone 6 ours die back to the ground each year, but come back from the roots. We still have to prune back the dead wood each year, but it’s not so drastic to need a chainsaw! We’ve got one white fig too, and I prefer the brown ones as well. Fresh figs are a real treat! It amazes me that plants can be cut back so severely and not only recover, but thrive. It still hurts me to see trees and shrubs cut like that, though. Lots of people do that to crape myrtles every year and I don’t know why. I’m glad you’ll have figs. I’m envious – no fruit trees in my garden. I am seriously wanting a fig tree! But I never knew people trimmed them back like that. I wonder if that’s ‘correct’ or just ‘traditional’. I’m so glad they grew back – they are beautiful focal points to the garden. Yum, fresh figs from a tree sound delicious. In my childhood, my mother would dry them, too to save the bounty for later. What a great post! I was thinking about your fig trees and if they grew back! I am so amazed that it can be pruned back so much and it grows back so vigorously! I wonder what other trees you can prune like that! To answer your question, Yes, Grapevines do require lots and lots of sun, at least 8 hours of it. Our vines get sun the entire day, there is nothing obstructing it so it gets no shade. Maybe one year we can do a fig / grapes trade!! I wonder if you “tip” a fig branch now if it would develop shorter lateral branches (and more of them) equating to more fruit, less height, less shading of nearby plants, easier picking ? By tipping I mean remove the end growing point, just a small amount of branch removed, but energy would be redirected to other growing points along the branch. Black raspberry canes behave that way but there are 9 months between the actual cutting and the fruiting. I cut them to achieve a uniform height and to prevent canes from arching over and rooting in the ground nearby (or scratching me every time I pass). Then #side branches increase dramatically and these have the flowers/fruits later. Your photos show the drama of the sawing job on the figs. It certainly was drastic. But your crop is ENVIABLE!!! I heard in the northeast area you should “tip” each branch before the real warm weather, say late June. Just recently heard this from a nursery in Boston that had, imagine this, 1500 trees. I have two tree’s myself. One about six (brown Turk) years old and the other about two yo. (Figobianco). This is my first complete year with a fig tree and from what I’ve learned so far, especially because I have them potted and bring them into my garage when going dormant, is to prune it back a lot. You can prune before you bring it in or before you bring it out for the spring. I prefer the spring because I had better luck propagating clippings at that time. If yours is potted and it’s time to re-pot, Do Not use a pot that’s too large. You will get plenty of growth but no figs. I say use a pot only about 20 to 30% larger than the previous one. Figs like a condensed root ball better than a roomy pot. Evo – I definitely freaked out when he got out the chainsaw. We were practically convinced we’d have to wait until next year for figs! It’s amazing. Villager – they are a treat indeed. Yours die back to the ground? Wow. This is my first experience with fig trees and I guess we are pretty lucky that they are so old and so protected on all sides…how tall do yours get once they come back up? Sheila – I know, it’s hard to see them being cut like that. I know the big tree needed it – it was so tall we couldn’t even reach the figs on top using the so-tall-it’s-scary ladder and they were going to waste. We’re so happy they’re happy right now! Holley – they do indeed become focal points. As they get big, they sort of create different “rooms” in the garden, which is kind of neat. If you were here I’d give you a cutting! GirlSprout – drying figs is a great idea! I’m planning on giving out canned fig something-or-other to everyone for Christmas this year, but if we have more figs than we can handle, drying might be worth a try – thanks! Cathy – oh, I hope your tree does well and produces some fruit for you! I know people here who have small fig trees and they bring them inside over winter as well..eventually plant them outside but wrap them in winter. Good luck! Mimi – I know – it’s so amazing! It’s got me thinking about other trees too…our nearly 20 foot beast of a forsythia, for example! Thanks for the tip about the grapes….sounds like we don’t have the sun for them at our place – awesome that you do, though! We should do a fig/grape trade later this summer! Bev – what a great idea to experiment with! I might just try that with one of the trees and see how it responds – not like it’s going to make or break the fig crop and not having to climb the ladder would make things easier. They are still producing new leaves at the ends of the branches, so perhaps I’ll try “tipping” them off. I’ll definitely bring some fresh ones to you when I come home at the end of summer! Last year they reached 10 feet tall. I finally pinched out the growing tips to rein them in! Okay, do you have any suggestion for me on how else to control the growth of the fig trees then? One of them grows to at least 15 feet high – too high for us to reach on the ladder, and the figs up top are wasted. 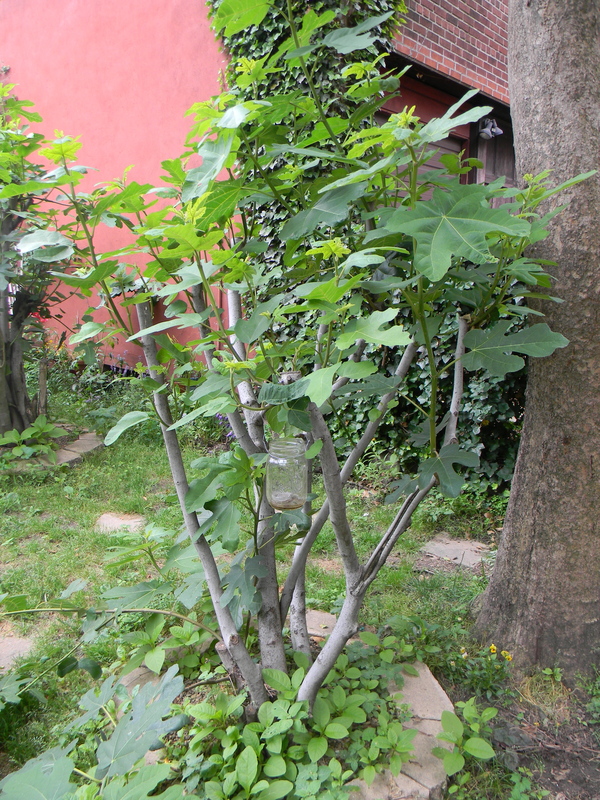 Fig trees are known to survive through some of the worst weather, isn’t it miraculous? I also grow figs, and enjoy having the REAL deal right outside my door. However, last year was an incredibly COLD winter and it was also the first winter when that HUGE fig (I planted another one a few years ago that is still very small) died back. I thought for sure it was a goner, but just couldn’t bear to cut it to the ground. Later in the spring we noticed leaves at the root, we left it alone, we didn’t even cut back the dead limbs, now in August it has figs again, not as many as before and we have cut the dead off. I live in Eastern Tennessee, and we do get cold winters. I would give it a go if I was anyone. IF it doesn’t work, oh well, but if it does… OH MAN! Wow, I feel better about trimming my fig trees now. I think I was being too delicate. 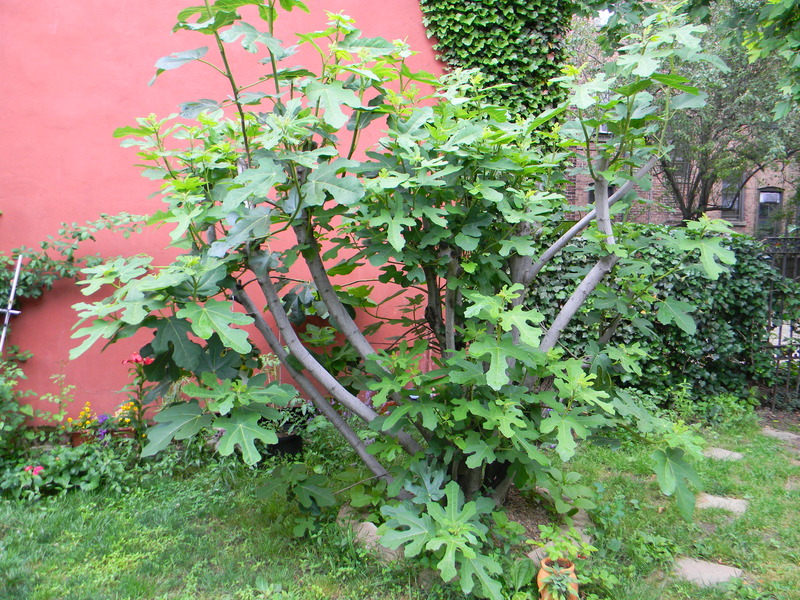 Two of my figs are gargantuan- maybe 15′ tall and at least 20′ in diameter. I will attack them more firmly- but, I don’t think I’ll take it as far as your landlord.